So during my efforts to study for the Juniper JNCIP-Ent ( Enterprise Routing & Switching ) exam, I happened to come across a Juniper switching feature called Filter-based VLANs. 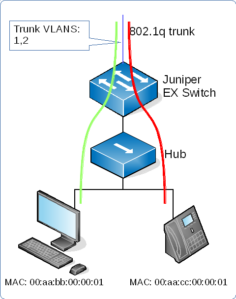 In normal VLAN-based switching, a device’s assigned VLAN is configured on it’s access port and can’t be changed no matter what is connected to that port. Filter-based VLANs work a bit differently – they allow the engineer to map the VLAN based on packet properties. Here we have a Juniper EX-series switch connected to an un-managed hub or switch. We want to map the PC into one VLAN and the VOIP phone into another. The EX switch then trunks the 2 VLANs up to a core switch. We do this with Filter-based VLANs. which makes things a bit more flexible if the same rule is going to be applied to many interfaces, or across multiple switches. I admit, there aren’t a lot of circumstances where Filter-based VLANs would be useful (maybe in service provider edge aggregation?). Most enterprises will be using managed switches everywhere – but then again, it’s a handy feature to know about.